Details of the awards and the application forms are available here. The inaugral 2018 Aotearoa New Zealand John Schofield 3Rs Implementation award was made to the Massey-SPCA Desexing Clinic. The Aotearoa New Zealand John Schofield 3Rs implementation award is named in memory of ANZCCART (NZ) committee member Dr John Schofield. This award has been created by ANZCCART to recognise the excellent service offered to Animal Ethics Committees by their members throughout Australia and New Zealand. As part of this award, ANZCCART will provide an all expenses paid trip for the recipient to the annual ANZCCART Conference. View details of the award AEC Member Award information 2019 including the eligibility criteria. The deadline for 2019 submissions is 22 April 2019. 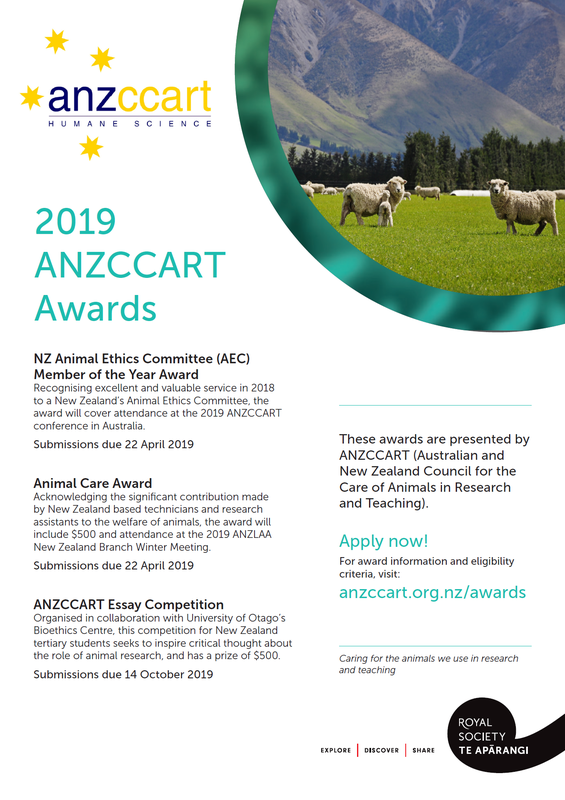 ANZCCART New Zealand has established a national award to recognise the significant contribution made by individual New Zealand-based technicians and research assistants, particularly in regard to the welfare of the animals. Award winners will recieve $500 and attendance at the 2018 ANZLAA New Zealand conference. The deadline for submission for 2019 is 22 April 2019. ANZCCART hopes to inspire students to think critically about the role animal research plays in today’s society and to engage with the difficulties that surround animal use. The student winner of the inaugural 2014 ANZCCART Essay Competition was Katherine Reid (Massey University), for her essay entitled Conversations to Improve Animal Welfare in Research and Teaching. The student winner of the 2018 ANZCCART Essay Competition was Alysha Mckeeman (University of Otago), for her essay entitled Moral Status and Obligations to Animals in Research. Submissions for 2019 will be due by 14 October 2019, and will include two prizes of $500. Conditions of entry and other details for the ANZCCART Essay Competition will be released shortly. To increase the profile of animal behaviour and welfare as a scientific discipline. To encourage students to investigate issues in animal behaviour and welfare. To provide students the opportunity to attend a conference to present their research and increase their profile by providing networking opportunities with other scientists working in the field.